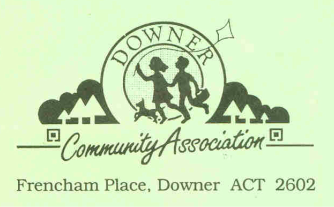 The Downer Community Association was formed in 1985 to represent the interests of Downer residents on issues which affect our suburb and surrounding areas. These include local facilities, planning and traffic, development applications, changes to parks and streets, and issues which affect local communities, such as Downer Preschool. In 1987, The DCA became an incorporated body, which was a key factor in having government agencies take our views seriously, and later, in obtaining the Community Centre lease. Because of the requirements for incorporated bodies, this also provides close scrutiny of financial transactions of the Association. A major focus of the Association is managing the Downer Community Centre. This is an ACT Government building, leased to the DCA at a peppercorn rent. The DCA rents rooms in the Centre to a large number of community groups. Rents are kept as low as possible to assist groups with limited funds to obtain facilities for their activities. Details of the Community Centre and the facilities available can be found on the separate Community Centre page. Membership of the Downer Community Association is open to all residents of Downer, and there is no charge for membership. Membership forms are available here. If you provide an email address, we can forward important information to you as it becomes available.